The mother shipfor a commercial suborbital spaceliner fleet made its longest flight yet Mondayin a test apparently marred only by some slight damage to thevehicle?s tail. The large WhiteKnightTwocarrier aircraft ?Eve? took off from the Mojave Air and Space Port inCalifornia, flying to some 20,000 feet on a successful four-hour flight ? 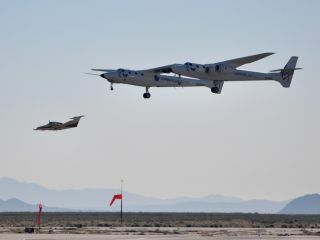 the longest sofar and a good initial endurance test, noted Will Whitehorn, President ofVirgin Galactic. While theflight test expanded the flight regime of the WhiteKnightTwo, an incidentcaused a heart-stopping moment for ground watchers when an apparent crosswind duringa landing strip maneuver pitched the vehicle up steeper than expected, causingslight tail damage, according to a SPACE.com source. Virgin Galacticis the spacetourist travel firm backed by U.K. adventurer and billionaire RichardBranson and his Virgin Group. Eve is named after Branson?s mother. TheWhiteKnightTwo is the mother ship for SpaceShipTwo ? also built by a workforceat Scaled Composites in Mojave, California. Whitehorn saidthat the aircraft?s gear was successfully retracted and extended in flight,with the craft running up in speed in both the gear up and down configuration.Furthermore, the aircraft?s flightenvelope was expanded in the areas of gross weight, as well as G-loadbroached, he said. ?We are delighted with the programso far and are meeting every milestone we are setting,? Whitehorn told SPACE.com. ?Sir Richard Branson is looking forward to flying in Eve this summer and thenseeing SpaceShipTwo attached later in the year,? he added. The WhiteKnightTwo waspublicly unveiled at the Mojave Air and Space port on July 28, 2008. While details remain a tad murky, thetail damage was apparently caused during a touch-and-go runway approach by WhiteKnightTwo,which created a ?pucker factor? in eyewitnesses watching the flight. According to a SPACE.comsource, during the maneuver, the WhiteKnightTwo appeared to have been caught bya cross wind and pitched up steeper than expected. The result was a tail strikeby both rudders of the large craft, according to one observer. However, the damage appeared to beminimal, with the WhiteKnightTwo later making a smooth touch down on thetarmac. Following a roster of testevaluations of the WhiteKnightTwo at the Mojave Air and Space Port, the craftwill carry the now-under-construction SpaceShipTwo - the two pilot/sixpassenger suborbital rocket plane. Virgin Galactichas ordered fiveSpaceShipTwo rocket planes and two of the carrier craft, with options onmore. The buckle-up pricetag per seat for a suborbital trek onboard SpaceShipTwo is $200,000.